Speaker stands call for a little investment and people generally ignore it. They would rather shove it in a corner of the room or in the showcase and feel elated. But if you are a music lover and you like experiencing the ultimate sound quality in your little space, it is important that you purchase the necessary requirements for your speakers. A speaker stand is so designed to elevate and enhance you listening experience that it suits every dynamics of your speakers and amplifies the quality of the sound. 1. Size: As is obvious, speaker stands come in every shape and size. What is required is that the size of the stand as well as its shape should be similar to the speaker that you have. Take for instance, if the speakers you possess have a base that has a square shape then the table-top of your speaker stand should also be square or must be slightly larger than the speaker’s base. 2. Weight Capacity: This is an important point to be considered. It is very obvious that large speakers will be heavier than the speakers that are small-sized. If you buy the wrong stand for your speakers then you will not only risk the chance of your stand being getting damaged but even your speakers can be at risk. It thus becomes evident that you need to check the product information provided by the manufacturer to ensure the weight capacity of each of the stands. 3. Design: The sound quality of your audio system largely depends on the design of the speaker stand. You need to be thinking judiciously in order to make you speakers efficient and effective. If you have a home theater setup then purchasing a rear speaker stand tends to make your sound system even more functional. But if you’re looking for better optimization of your audio system then surround-sound stands permit for apt positioning of the system. 4. Placement: It is essential to note that your listening experience depends quite a lot on how your speakers are placed in the room. Improper placement of the speakers may not yield a good experience. You can ask for help from your friends or neighbors to position the speakers in different areas to find the best location. 5. Construction: The construction of speaker stands also plays an evident role in optimizing the functionality of your speakers. The stands must be durable and sturdy. They should be quite well constructed so that they can endure the capacity of speakers and also help in optimization. Hardwood speaker-stands or metal speaker-stands both stand to elevate the aesthetics of your speakers. 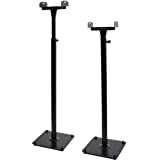 Keeping all the above points in view, you can purchase the best speaker stands for your stereo speakers or home theater speakers. The investment though a little is a valuable investment. This speaker stand is apt for placing your audio system at the desired height in order to obtain surround or stereo sound. The stand has been constructed of cast iron with black-matte finesse and has a sturdy and durable built to withstand speakers having capacity of 2 pounds. It also has a wide three-leg base. The stand can be adjusted from a height of 27-48 inches. 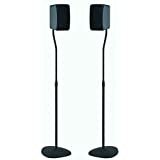 It also consists of a support pole and base-conceal speaker-cables that are so designed to be kept out of sight. It supports satellite speakers having weight up to 5 lbs. The robust and durable design of the stands appeals to the buyers. The base of the stand is wide enough to avoid toppling over due to any clumsy handling. The height is easily adjustable because of the feature provided by the stand and moreover the price at which it is available is unimaginable. The only difficulty that the buyers usually encounter is in the installation of the stand. But it is recommended usually that the manual should be read carefully before carrying out any step. The SANUS speaker stands can fit up to 3.5 lbs satellite speakers without much difficulty. 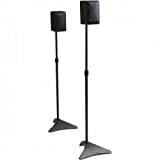 Moreover the speaker stand also has the feature of adjusting the height easily from 28-38 inches. The stand itself weighs 11 pounds and comes with a 5 year manufacturer’s warranty. It even includes a top plate, a keyhole adapter and L-shaped brackets. The heavy gauge steel pillar acts as an offset for optimizing the sound quality and also comes with an integrated wire-channel that provides for easy management. This speaker stands are not only easy to install but also have an attractive design to hold your speakers in position. The stands are furnished with multiple holes and the rear speakers can be fitted very easily in them. Moreover the height adjustment feature makes life much easier for the buyers and music lovers. The only difficulty that the users usually face is that it is not designed perfectly because some speakers cannot be held in position with the help of these stands. The wiring also troubles the users at times. The stand has been basically designed to hold satellite surround speakers manufactured by some major renowned manufacturers. The height adjustment feature can position it from a height of 26.5 inches to 47 inches. The top plate or the table top is capable of panning 180 degrees and also providing a tilt of +/- 10 degrees. This helps in adjusting the levels. The wire management is concealed and successfully helps in easy installation and it also comes with a side clamping top-plate. The stability is ensured with this stylish black matte finish steel stands. The stands are well constructed, sturdy and durable. Undoubtedly they have an appealing design which the buyers usually like. The height adjustment feature is a great thumbs-up for the stand. The users can adjust the height according to their preference and be completely satisfied by the audio experience. The only part that the users usually complain about is the installation. It is a little tricky but once you get the knack of it, it becomes easier. What Are The Best Bluetooth Speakers Under 100? Copyright © 2015 MyGameWeapon. All rights reserved.